At Bowman Masonry & Waterproofing, we install patented sump pump systems that have been developed by Basement Systems®, Inc. since 1987. They include the best cast-iron sump pumps and longest-lasting battery backup pumps in the industry. A sump pump system will keep your basement dry and able to be used for storage or any other idea you have in mind. 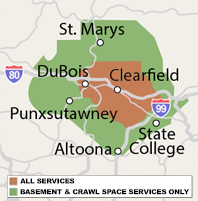 We proudly install sump pump systems in basements throughout Pennsylvania including Saint Marys, Bellefonte, Altoona, State College, Du Bois. Their manufactured sump pump systems have been professionally tested to ensure optimal performance and durability. Bowman Masonry & Waterproofing specializes in the installation as well as the repair and maintenance of your sump pump and backup sump pump. We can install your sump pump today! Here at Bowman Masonry & Waterproofing, we specialize in quick and efficient sump pump and backup sump pump installation. Our staff is full of trained basement waterproofing experts that can assist you in all the services necessary to keep your basement space dry and healthy. We offer free sump pump installation quotes to homeowners in our Pennsylvania service area including Kersey, Port Matilda, Tyrone, Pennsylvania Furnace, Ridgway, Brockway, and more. Each quote includes an on-site consultation, written price quote, and a copy of our 88-page waterproofing book "Dry Basement Science: What To Have Done...And WHY."